We survived our first day of homeschooling for our new school year. It was a very very long day!! I awoke Curly before everyone else so we could start out school without too many interruptions. Ladybug had other ideas and she was awake before the sun and waiting at the top of the stairs as we tried to start school. I tried several things to entertain her but finally gave in and let her watch Sesame Street. Curly did great during her early morning school time which consisted of math, spelling, writing, and grammar. We reviewed math facts with flashcards as well as all the phonograms that she knows. I gave her a review spelling test and she did pretty well! We reviewed nouns and also started learning how to summarize short stories. Then it was time for craziness as we had a fun breakfast together with memory. We had to quickly put on swim suits to get ready for our swim lessons. Before we ran out the door we had a scavenger hunt for school supplies and then we went to our pool. We spent two hours at the pool for swim lessons (each child has a 30 minute private lesson) and I entertained the kids who weren’t currently in the lesson. I’m not sure who’s more exhausted after our swim lesson days – me or them! Next we came home for baths; we practiced piano; and then we had lunch time. During lunch we watched some praise and worship videos and talked about our character trait for the week – Kindness. After lunch the little girls took naps while I worked with Tiger and Bee on math and reading. Tiger practiced addition with the abacus, reviewed phonograms, and read me several stories. Bee started her new math program and practiced handwriting. Curly read books, started a book report, did handwriting, and completed several math pages while I worked with Bee and Tiger. Then I rotated doing violin practice with each child. Once we were done with violin, we had some read aloud time on the couch while the kids played with the Playmobil sets. Once the little girls were awake, all the kids had some computer time and worked on a few programs while I picked up the house, did laundry, and started preparing for dinner. After computer time the kids were waiting by the front door to watch for Daddy to come home! Ladybug is very, very hard to entertain during school time. I must have some ideas ready to keep her busy! Ladybug is apparently a morning person – none of my other kids share that trait. It’s best to have a cup of juice or milk waiting for everyone when they wake up. I need to wake up long before the kids so I can mentally prepare myself for the day. I’m going to need some serious prayer time before I tackle the busyness and challenges of each day. The middle children (Bee, Tiger, and Ladybug) do not play well together when left alone. I’m going to have to divide them up for play times! I need to carefully carve out special time for both Ladybug and Punkin so that we can have some learning/play time together each day. This is going to be one very long semester with a toddler and a baby! I’ll need to just stick to the basics and keep things simple! Would you share where you bought that awesome looking alphabet necklace? I think my preschoolers would enjoy it. But I think I purchased it at a local school supply store. 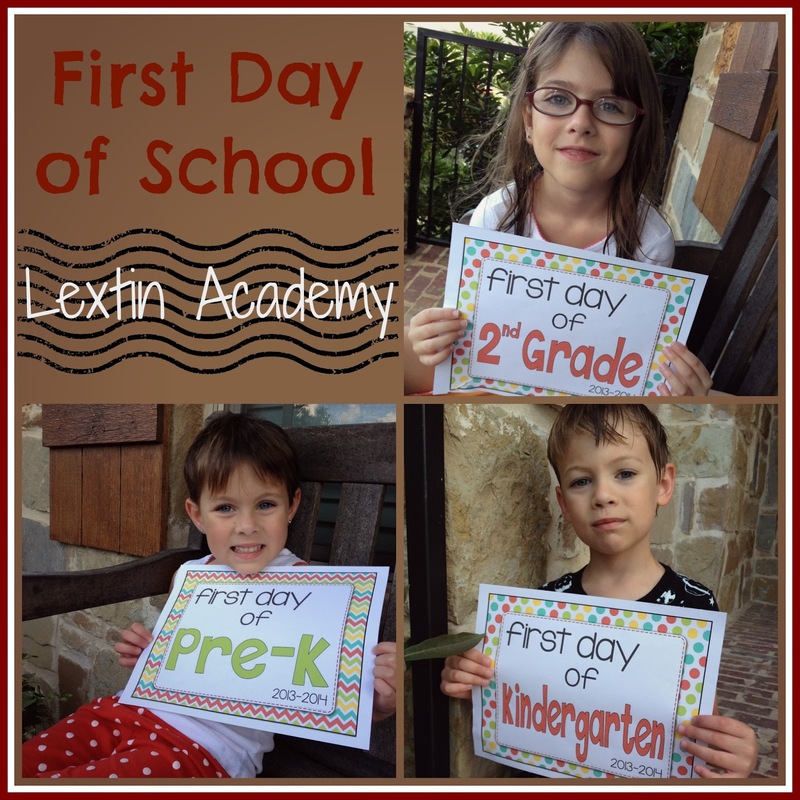 The first day is always the longest but yours looks so creative and wonderful! After 23 years, this year we transitioned into our new year this week. We started half of our classes this week and will add the rest next week. It sounds like you accomplished A LOT, especially for a first day of school! Good job. Thank you! We had a good but very busy day!